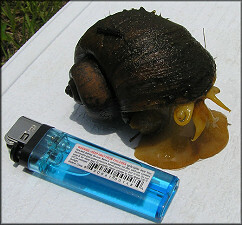 In May/June of 2005, a survey crew comprised of stream ecologists on the faculty of the University of Alabama and under contract to the St. Johns River Water Management District (SJRWMD) reported the presence of Pomacea canaliculata (both dead shells and egg clutches) in a residential area of far southeastern Duval County. This impressively sized non-native species, although widespread in central and southern Florida, had not been previously reported from northeast Florida - specifically Duval County. A topographic map of the reported sighting area was generously provided by Dr. Dean Dobberfuhl of the SJRWMD on July 11, 2005 and this scribe conducted a visit to the area in question the same date. 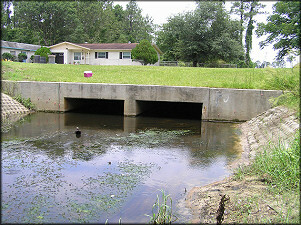 The sighting location was a drainage ditch and associated concrete box culvert running under a two-lane road in a residential neighborhood close to the convergence of Powers Avenue and Old Kings Road South near Wolfson High School. 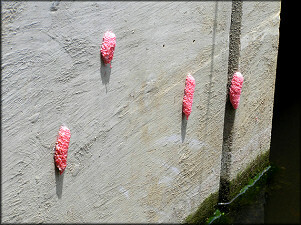 Upon arrival at the site, P. canaliculata egg clutches were prominent on the culvert and nearby vegetation and a large Pomacea was spotted crawling along the shoreline. This specimen (measuring a respectable 70 mm.) was duly captured - representing the first formally documented collection of a live specimen within the county. A total of 17 egg clutches were counted in the immediate area. As no additional egg clutches were seen well downstream from the culvert, the upstream source of the drainage ditch was investigated. The source proved to be a fairly large lake impounded by a dam. A more accurate description might be to call it a large retention pond for the purpose of flood control. 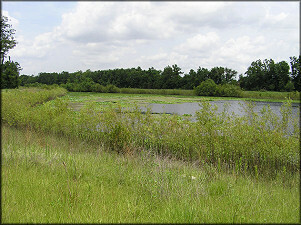 The lake appeared to be relatively shallow and was overgrown with water plants. Investigation soon revealed P. canaliculata egg clutches were not uncommon on the impoundment's periphery . An additional even larger living specimen was subsequently collected from the shoreline. The next day a follow-up visit was made to the area and this time the lake was circumnavigated. During this sojourn a third live P. canaliculata was collected. A cursory perusal of the drainage ditch which feeds the lake failed to reveal any signs of Pomacea in that area. Based upon observations to date, it's possible that the species may thus far be confined to the lake and close by areas - a location where it was apparently intentionally introduced by a misguided or uninformed individual or individuals. Further investigation may yield additional information. 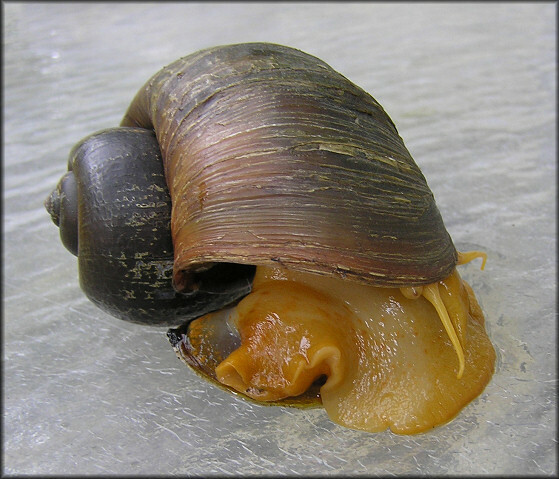 A full listing of the molluscan species found thus far in the general area of Baker Skinner Park can be found at: Highlights Among Northeast Florida Non-marine Mollusk Collecting Locations.